If You Care About a Nonprofit, You Need to Watch This Video | Prodigy & Co. In the nonprofit world, overhead is a dirty word. Funders and supports want all of their money to go to programs. To the work that helps the population they care for. It’s understandable. If you care about seeing a problem solved, you want to put your money directly to the problem. The problem lies in not recognizing salaries, marketing, fundraising, and other admin as having an impact on solving the problem. If you can’t pay staff a livable wage, they won’t stick around. If you can’t spread your message, you won’t gain new supporters. If you can’t fundraise, you can’t multiply your money. 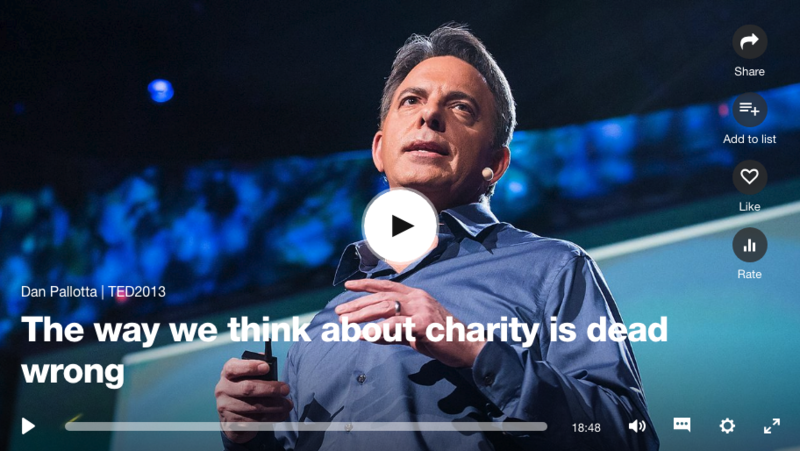 This TED talk from Dan Pallotta is one of the best primers I’ve seen on this double standard that nonprofits face. If you care about a nonprofit or a cause (and especially if you give) watch his talk. It’s 18 minutes, but’s it’s worth every second. Once you watch it, I want to know what you think. Email me at jessica@prodigyandco.com and let me know. Let’s keep the conversation going and work to change the mindset around overhead.